This Lincoln Circle neighborhood icon was rebuilt in 2012 with thoughtful harmony between the original 1880 facade and the fabulous expanded new interior. The spaces within are both casual and elegant in the spirit of Nantucket living. Complete with three finished floors there is room for generations & guests. The character of the house is enhanced with unique elements like antique pane glass, reclaimed oak, antique limestone and contemporary tiles. The beautifully landscaped lot offers generous space for the 12X36 pool and gardens. At the rear of the property is a great guest/pool house with adjacent 1-car garage. Architecture and design by Lisa Botticelli, Botticelli & Pohl. 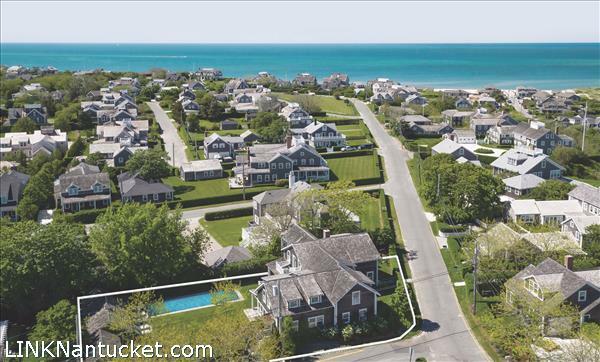 Plans available for a widows walk that would enjoy extraordinary views across Nantucket Harbor and Nantucket Sound. Please send me more available listings similar to 2 Lincoln Avenue, Cliff. Thank you!